Toni Point and Alysia Fields met while studying Architecture at Mississippi State University. It was that love of architecture and culture that brought the pair to New Orleans years later. After graduating from MSU, Fields pursued a second degree in sociology, and then went on the earn her MBA, which she put to good use while working a corporate job at Saks Fifth Avenue. A few years in, though, Fields realized she missed being creative. In 2016, she quit her job and reunited with Point to form Statement Goods — modern and unique art and goods that make a statement. The duo now spend their days making art, creating patterns, designing cards, and crafting jewelry. Their products, which can be found around town at Home Malone, Nola Boards, Glitter Box, and Zele, are all very southern in sentiment. Working with a variety of mediums — printmaking, painting, and ink drawings — most of their artwork is pattern-based with a modern, minimalist aesthetic. “We’re both huge foodies, so obviously this is what inspired our New Orleans Food Print and our Jambalaya Print,” says Fields. “We’ve also created abstract shotgun house illustrations, which are a nod to the local architecture,” Point adds. 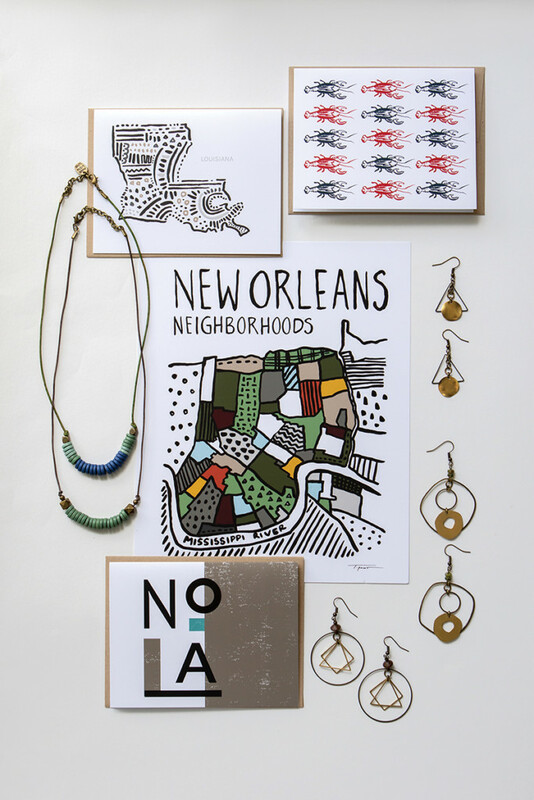 The creation of a Louisiana State print inspired the pair to do prints for all 50 states, further expanding the reach of their homegrown products, which can now also be purchased from stores including Beacon Home in Temecula, California and Oliver & Chatfield in Cornwall, New York. But while their range continues to grow, New Orleans will remain home for the artists, as it provides something it seems no other city is able to.